It doesn't matter how high-quality your videos are, or how pricey the equipment was that you used to make them, if you don't have a way to present them on your website. Thanks to today's discount software promotion, Ripe HD FLV Player 1.5, you'll not only be able to stream videos, you'll do so in a way that's stunning and impressive. Ripe HD FLV Player 1.5 lets you stream high definition Flash video content on your website, offering an array of features that include custom advertisements to drive revenue. With support for all video formats that are supported by Flash Player, there's no doubt you'll be up and running quickly with Ripe HD FLV Player 1.5. In order to motivate your video to go viral, you know that you need to get people talking about it on social networks. Instead of coding to support every Facebook, Twitter, and MySpace out there, why not just use Ripe HD FLV Player 1.5 and enjoy integrated support for sharing to 13 social networks right in the player? If you've already got your videos uploaded to YouTube and you don't want to move them, don't fret! Ripe HD FLV Player 1.5 is able to stream videos from YouTube, while still offering the cool interface and customization that you crave. 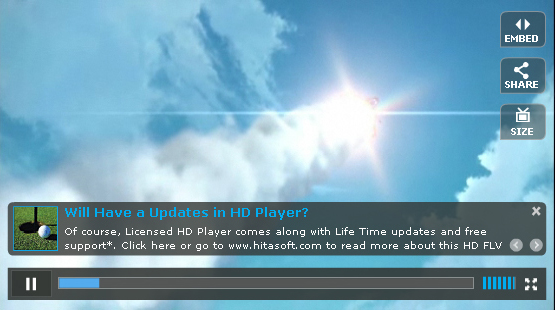 After you purchase Ripe HD flv Player 1.5 it may be used indefinitely. Ripe HD flv Player 1.5 is licensed per user, so if more people are going to use Ripe HD flv Player 1.5 you will need to purchase additional copies. Ralph Bressler Where did the $99 price come from? THe price on the website is $55! We request you to make the payment here for your desired packages and plugins. Once you paid, send us a mail to info hitasoft.com with the following details. Once we received the details, our support guys will contact you. This seems to indicate that FIRST I pay and THEN the company will send me program or key or something. WHat does this mean? I find it interesting that Firefox tells me the website is hosted in the US yet the English on the website is terribly wrong. I know that I could not even attempt to write in Russian or Chinese but the lack of proper English make me feel that the company may not really want my business. Ralph Bressler I downloaded the program from their one place on their website. I got a zip file with NO INSTRUCTIONS for use. I unzipped it to a folder and clicked on the html file. A player displayed with information about a video. I clicked on the play button and...nothing! Is this because it must be installed on a web server? There are again NO INSTRUCTIONS on how to setup or configure the player for your own use! I clicked on another download button on the same website and was asked to fill out name, e-mail and so on and the files would be emailed to me. Would these be the same files that I already downloaded that do not work and have no instructions? I have already spent 30 minutes and have gotten no where. This is too much work for a questionable result. I will pass on this program and suggest others do as well. I am surprised Bits would strike a deal with a company like this! Jac A. @Ralph Bressler: I've downloaded the same file (HitasoftRipeHDPlayer_Free.zip) and you're right, it won't work in a normal folder. BUT IT DOES WORK in a server, or in your own machine if you unpack the files in a localhost environment (IIS or Apache). 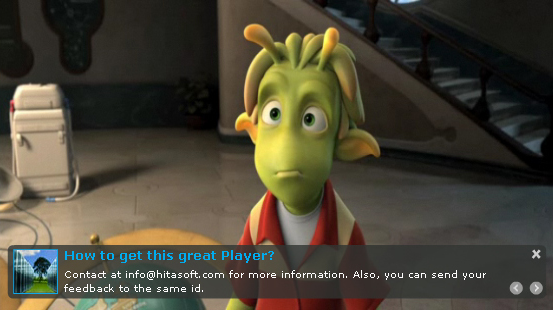 The player is a flash object that's intended to be hosted on a webserver so you can have webpages that play videos. So yes, you'd want to install the files on a webserver. However, you are correct that the demo download package doesn't provide any documentation to speak of. Ralph Bressler @ Jac A. Were you able to determine where the $99 price came from or find instructions on how to use the thing? Look at config.xml file (inside "xml" folder) and search for "HDVideoPath", that's the link for your movie. "VideoTitle", "VideoDescription" and the rest are self explanatory. There are more variables for social sharing, personal sharing (email, etc) but I guess those are beyond the test for now. Ralph Bressler @Jac A. I too have done a bit of programming and, in fact, taught it for many years. However, when I buy a program I expect at least some minimal documentation. I also expect the program author/distributor to take enough interest to answer questions and address issues here! I hope this will be the case sometime today. VLM I'm curious ... I have been under the impression that flash is going the way of the dinosaurs, that newer technologies in HTML5 are rendering flash obsolete. Yes? No? Dave McBay Why would I want a Flash-only player when there are others that can serve video in both Flash and HTML5 for all the iPad users out there who can't see Flash? Even Adobe seems to be giving up development on Flash for mobiles. Constantin Florea Apologies on the regular price issue. The correct regular price is $55.00 and we've changed the promotion page to reflect this. Ralph Bressler Why has the author of this program remained silent? This is another indication that this is a program best avoided! We really appreciate all your comments and I agree that you guys are right only. I don't want to say any reason for lack of documents, but usually we help our client installing our product by getting the queries from the email and support tickets. But this time we will make the readme document to explain all what you need. We will try to cover as much as possible. The regular price is 55$ only. We are working on the HTML5 version also which will be released in the coming months. We know flash is going down slowly, but i pet our player is most attractive player and easy to use and much more better than the other player that you can buy for more than 100 bucks. We have some buyers from bitsdujour already and we started contacting them and helping them till they got it working successfully on their website. The English in the website is not up to mark and it is been complained by our regular clients too. We will change it as soon as possible. I can guarantee that what you are gonna pay here is worth in your website when you see the player in action. It is really a light weight and not complex code in install. I will come with my next comment once the documentation is done. We are not decided this html5 player package plan yet. Our current plan it is to update the wordpress video plugin (paid version) with html5 option and once everything is done, we will add this option in the ripe flv player 1.5 version.